The Annual Survey of Programs was disseminated to program directors of 613 NAACLS accredited and approved programs in late 2017. Submission of the completed survey is required annually by the accreditation and approval standards. Presented here are data indicating numbers of NAACLS accredited and approved programs and graduates, certification examination pass rates, graduation rates, and placement rates. Also included are data reflecting trends in program resources and program director turnover. Ten (10)-year longitudinal data for the numbers of programs by program type appear in Table 1. The data reveal increases in the total number of programs from 479 accredited and 63 approved programs in 2008 to 544 accredited and 67 approved programs in 2017 and that trend is seen for all program types except Cytogenetics (CG). In terms of the percentages of total programs, the most concentrated areas of growth are seen with Medical Laboratory Technician (MLT) (16% increase from 2008-2017) and Histotechnician (HT)/Histotechnologist (HTL) (24% increase over the decade) programs. The numbers of Medical Laboratory Scientist (MLS) programs grew by 5%; the number of Phlebotomy (PBT) programs is essentially stable. The numbers of Diagnostic Molecular Science (DMS), Pathologists’ Assistant (PathA), and Clinical Assistant (CA) programs increased during the 10-year period but the statistical significance, if any, is difficult to determine based on the smaller numbers of programs. Suzanne Campbell, ASCLS President, and William Hunt, NAACLS Board President Elect. NAACLS is pleased to announce that William H. Hunt, MBA, MLS(ASCP)CM, President-Elect of the NAACLS Board of Directors, was selected to receive this year’s ASCLS Bio-Rad Scientific Assembly Professional Achievement Award for Lab Admin/Consultant/Quality/Accreditation/Industry. 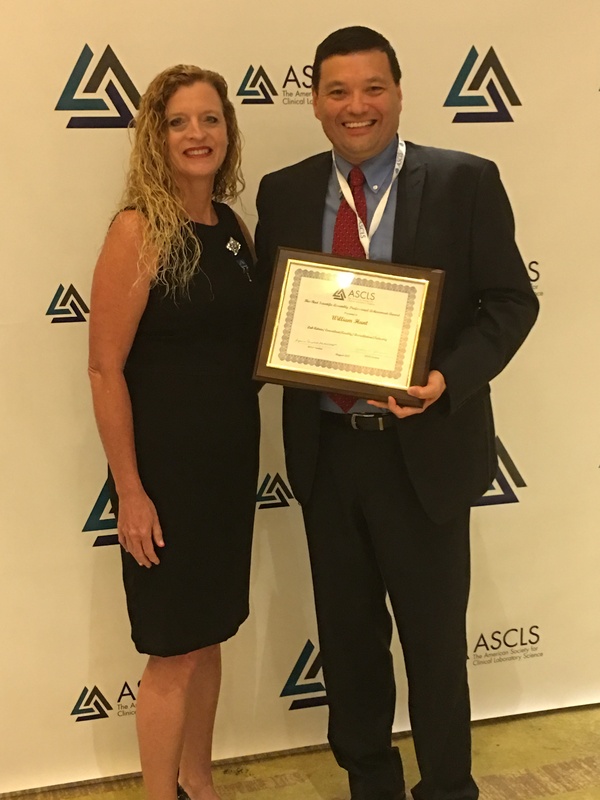 Mr. Hunt was recognized during the 85th ASCLS Annual Awards ceremony, which was held on August 3, 2017, in San Diego, CA. Congratulations! In the fall of 2015, NAACLS disseminated the Annual Survey of Programs to accredited and approved programs. With the 2012 Standards, NAACLS shifted from a largely input-based focus to one that features student and program outcomes as a means of evaluating educational quality. In keeping with this focus, a number of changes in policies were implemented including the establishment of benchmarks for several outcomes measures and the requirement that all programs post outcomes data for certification exam pass rates, graduation rates, and placement rates in a location that is easily accessible by the public. All accredited and approved programs are required by NAACLS Standards to complete and submit the Annual Survey of Programs each year, and this survey collects outcomes and other data that are then analyzed collectively for trends and useful “snapshots” of the quality of NAACLS’ programs. As I peruse the ASCLS’s Educators Listserve, it is so heartwarming to see the comradery between our educators. I notice that a number of important topics are currently addressed. The topics run from current and up-to-date textbooks, proper and affordable instrumentation to be used in the student laboratories, online offerings, recruitment, grants, credit hour reduction, and clinical rotation shortages. The ASCLS Committee on Education Programs and Initiatives (CEPI) plans to submit a proposal to the CLEC 2017 on finding ways for clinical sites to take (more) students for rotations. Also, I serve as a member of a taskforce on the Association of School of Allied Health Sciences (ASAHP) and we are also examining various issues relating to clinical education. This would be a great time to combine forces and share our findings to improve and expand much needed clinical experience opportunities for our students. April 26, 2016 In Case You Missed It…The Annual Volunteer Report is available on the NAACLS Website! And as always, the report contains information to let you know how you can be involved as a NAACLS Volunteer. We hope to hear from you soon! We invite you to view the NAACLS 2015 Annual Report on our website at: http://naacls.org/docs/AnnualReport.pdf. The Annual Report includes a Message from the President, 2015 Program Data, 2015 Board of Directors’ Actions, 2015 Volunteers, Statements of Financial Position for FY ending June 30, 2015, and Rosters for the NAACLS Board, Review Committees and Staff.